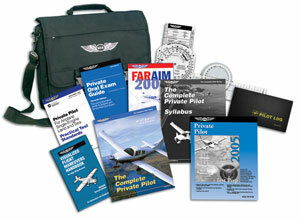 The perfect Private Pilot Training Kit Part 61 for introductory students with all the necessary books and supplies needed, all carried in the new ASA Pilot Briefcase. This ASA Private Pilot Training Kit provides the books and supplies a student pilot needs to complete training at an exceptional value. The Part 61 Private Flight Training Kit ensures that FAA requirements are met, and are the perfect training solution for both instructors and students. For students taking flight training courses at a smaller flight school or through a freelance instructor, this Part 61 Student Flight Training Kit includes everything they'll need, packaged in the ASA Pilot Briefcase. The Complete Private Pilot by Bob Gardner is the primary textbook for this kit, and the top-selling ASA FAR/AIM and Private Pilot Test Prep books are also included to assist in preparing for the FAA Knowledge Exam. The Practical Test Standards, Private Oral Exam Guide, and Visualized Flight Maneuvers for High-Wing Aircraft help take students through their Oral and Practical exams. Also in this briefcase is a fiberboard E6-B flight computer and Ultimate Rotating Plotter for all flight planning, and a Standard Pilot Logbook for keeping track of flight time. ASA student flight training kits bring pilot training to a new level, providing one-stop-shopping for the student and instructor. For more information about Private Pilot Licence Requirements, please refer to our Private Pilot Licence Information Page. This David Clark Headset is a best seller. Extremely lightweight & comfortable. Provides 23dB of hearing protection. The ASA Pilot VFR Kneeboard includes a leg strap, pencil holder, strong metal clip & useful VFR information tooled onto the attractive, brushed aluminum kneeboard.